Technically I didn’t make this and it was a gift…but I figured you wouldn’t mind seeing this darling quilt! Kathy was so sweet and sent this to me for Jane, even using some of my favorite fabric prints, and the softest Amy Butler flannel backing. This would be a great way to use those mini charm packs (a pack of 40 or so 2 1/2″ squares), or even 2 1/2″ or larger square scraps. 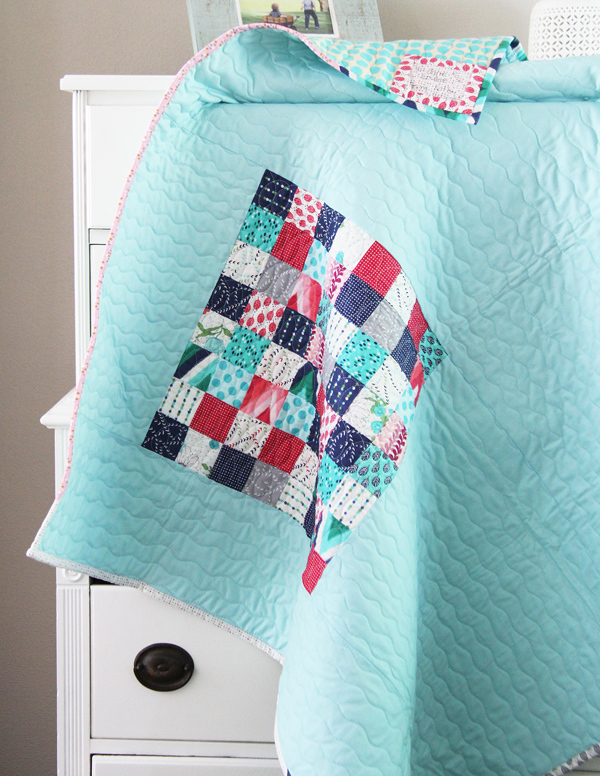 The scrappy binding and the label just make this quilt even more special. 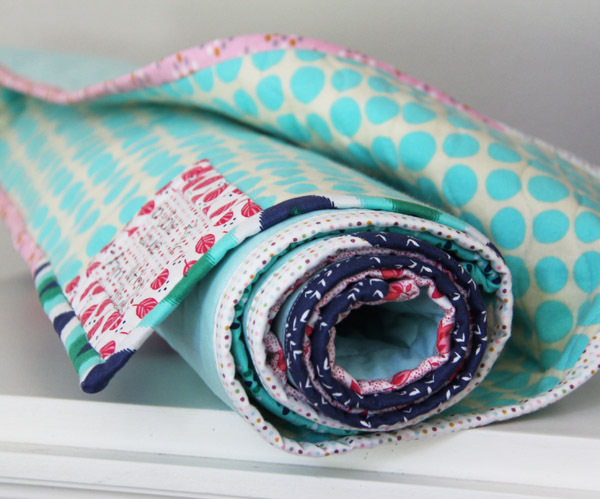 Kathy’s quilting is amazing too of course…see those cute loopty loops in the print squares? Love that idea! This little gal approves. Jane is already 6 weeks old! I want to hit “replay” on the past 6 weeks…it went by too fast! She has the craaaaziest hair. I wet it and comb it down and by the time it dries it is sticking straight up in the air! She rocks it. What a precious little quilt! And your girl is adorable. I am absolutely loving her hair. So cute! Love that aqua! Ah, that cuties hair brings back memories for me. My son had the same kind of hair and it stuck up so straight that we called him cockleburr for a while! Beautiful Jane. Love your hair. The quilt is wonderful. Such a great quilt, and it would be so good for those sort of last minute things we sometimes need. Jane’s hair? Me, every day, but I am not nearly as adorable wearing it. Hi! I’ve been reading your blog for quite a while, though I don’t think I’ve ever commented. I SOO enjoy it. So many beautiful quilts, ideas etc. Just wanted to say congratulations on your baby. She is just adorable, and your right, totally rocks that hair. My oldest son had the same thing going on. I could slick it down with lotion and it came right back up, lol. He’s 43 now and shaves his head, lol. Enjoy your day, and that sweet baby…it goes soo fast! Thanks Debbie! I’m the worst commenter EVER on other blogs. ;) I hope she’ll keep that stick up straight hair…because she’ll have amazing volume if she does! ;) Have a great day! Love the quilt. Jane is a darling! She has a very confident look on her little face. The hair will never be an issue. Enjoy every minute cuz it does go fast. Oh wow, what a babe and what a great quilt! and yes Kathy is so very awesome, I know her personally and what be like her! She is the sweetest I agree! So many beautiful pictures in this post! 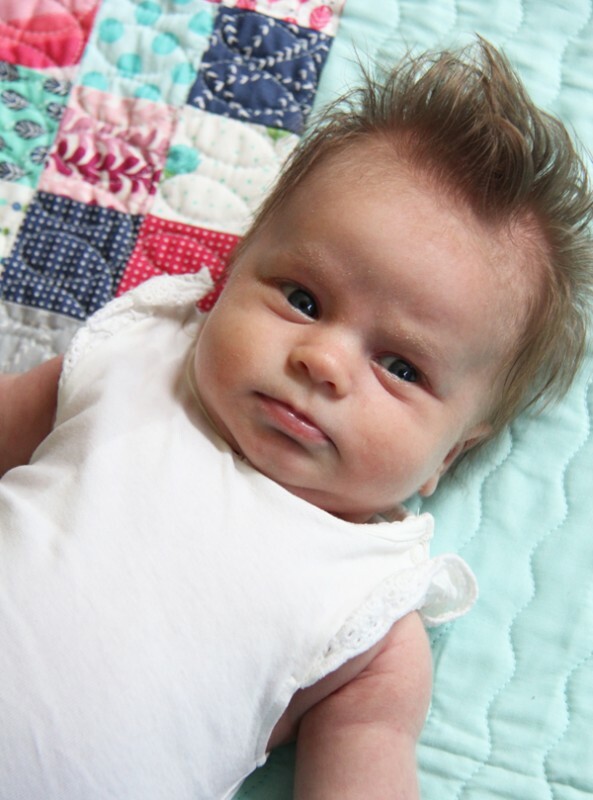 Quilt, baby, rocking punk hair! Love it all! She is beautiful and so is the quilt. My granddaughter had that lovely hair and now at almost three has beautiful hair that everyone envies. And yes, it finally laid down. Jane is so adorable as is the quilt. Love the aqua. The quilt is cute, but Jane is a doll!!! I think I just found the perfect quilt to make with my Daysail scraps! It would be darling in Daysail!!! Jane’s a keeper!! Sweeter than a Holmes Co. cream stick!!! :o) Pretty nice quilt too! The quilt is cute and cuddly looking and your little one is even cuter and cuddlier :)! Our second child also had hair like that, but only for a short period – special memories. Enjoy!! Love your blog too Alison. I used Kathy to quilt one of my quilts after seeing her lovely work on your blog previously- her first international customer-whoop! She really is a lovely person making the whole thing a complete joy! Love the beautiful quilt she has made for Jane, especially the loopty loops. Cute little quilt by Kathy; adorable little Jane by you! Jane looks a lot like Ben…. in my opinion. Love the wild hair… look out world! A beautiful baby but maybe she doesn’t like you talking about her hair. That second picture showed a different facial expression – still beautiful though. Both are so sweet, just precious! I’ve never had that much volume, natural or otherwise! How sweet of a gift- that quilt is adorable and I love that aqua!! And little Jane couldn’t be any cuter!! Loving her hair- and I agree- she rocks it!! :) Have a wonderful weekend! What a lovely baby quilt, love the colors, the quilting is so well made, love your girls hair! she is so cute. Jane is so adorable too, My second daughter, Lizzie, had hair like that. It stuck straight up. Once it gets longer it will settle, but sometimes it does make you laugh, Take lots of side view pictures of that, Hilarious. and of course so exciting when they start eating food and squashing it in their hair. hahahaha Lizzie used to get so mad when I would have to wash her hair out after meals…. there has to be a better way…. a tiny shower hat? Love everything about the quilt! I usually have a big stack of 2.5″ squares just looking for a home. Your model is so sweet, too! I love that quilt. Aqua is my favorite color (since childhood) and the navy, pink and white are perfect with it. And that precious baby! She is so adorable and I agree that she rocks the hair! Jane is just too adorable! The quilt is so sweet, but looks best with Jane included! Oh what a cutie – I couldn’t help smiling all over when I saw her. Wish you all lots of fun and joy together! Awwww – enjoy your time with her! Yes, it all goes by in the blink of an eye! Jane looks so much like my daughter did! It’s uncanny! Especially the hair! Love it! OMG, look at that face and CRAZY hair…..I LOVE it! The quilt is gorgeous and perfect for Jane! 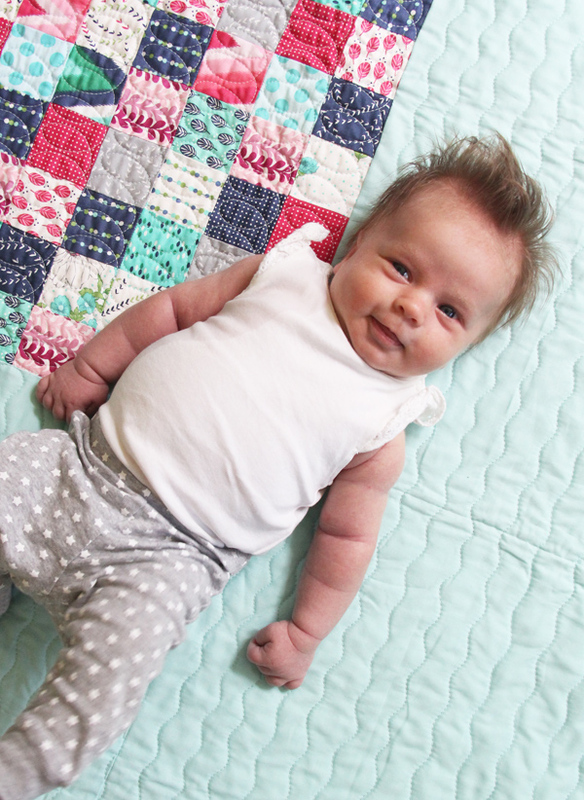 Oh gosh baby Jane is adorable….love the quilt too! Yes they grow up too fast! It’s a darling quilt, but your precious Jane is the star of this post. Love, LOVE her punk rocker hair! She’s perfect. I hope you are doing well, getting plenty of rest, and enjoying every moment of this new life in your nest. Oh my! Jane is so precious. And you are right; she totally rocks the voluptuous hair. Love the quilt and the quilting. Jane has gotten so big and she is such a cutie! Enjoy this time. Jane is such a beautiful baby and so happy, congratulations!